March 22nd - 24th: You'll find J.B. working non-stop at the NASCAR Sprint Cup Auto Club 400 just like he's done at every race since the Auto Club Speedway opened in 1997! In addition to hosting the Fan Zone's big stage, he'll be doing major driver interviews including Q&A sessions with NASCAR stars Jimmie Johnson and Danica Patrick. He'll also be hosting the Fan Zone's big stage as well as calling both the NASCAR Nationwide and NASCAR Sprint Cup races from the announcers' booth. See you there! April 19th - 21st: Join yer Uncle Joe for a live broadcast from the Roar By The Shore &mdah; the Toyota Grand Prix of Long Beach! Just like he's done every April since 1986, J.B. will be doing Saturday and Sunday Meet & Greets and hanging Bruce Flanders and Terry Clanton on the PA. You'll have a blast! If you have any questions, just send Joe a note. December 13, 2012: Before hosting the 2012 KLOS Christmas Show featuring The Doobie Brothers at the Nokia Theatre, Uncle Joe broadcast the Pre-Party LIVE from Lucky Strike L.A. Live in the Nokia Theatre LA Live plaza. Then it was over to the Nokia Theatre where this year's KLOS All Star Band which included former Eagles lead guitarist Don Felder; Beach Boys founding members Brian Wilson & Al Jardine; Chevy Metal featuring Taylor Hawkins & Chris Shiflett of the Foo Fighters; Mickey Dolenz of The Monkees; Rudy Sarzo of Ozzy Osbourne's band & Whitesnake; Steve Lukather & Steve Porcaro of Toto; Jeff Keith & Troy Luccketta of Tesla; Orianthi of Alice Cooper's band; Danny Seraphine of Chicago; famed bassist Leland Sklar; Ed Roth who's worked with Rob Halford & Tom Morello; Gregg Bissonette who's worked with Ringo Starr & Don Henley. Wow! December 8, 2012: If you like motorcycles, the 24th Annual Progressive International Motorcycle Show at the Long Beach Convention Center was the place to be! After checking out hundreds of new bikes from all of the leading manufacturers plus rare exotic bikes in the Dream Pavilion, J.B. spent time talking with fans at the KLOS Cool Patrol booth. December 3, 2012: Another misty, chilly morning and Unc was looking oh so stylish in his "Official Orange Apron!" Hanging and sharing stories with the contractors at The Home Depot at 21218 Roscoe Blvd. (near DeSoto) in Canoga Park, he declared this to be the best contractor's breakfast ever! December 1, 2012: Nothing like checking out the latest cars at the L.A. Auto Show, then discussing them with Uncle Joe at the KLOS Cool Patrol site! November 18, 2012: A whole bunch of folks spent some quality time hanging with J.B. and the KLOS Cool Patrol at the O'Reilly Auto Parts at 37 Las Tunas Drive (near Santa Anita) in Arcadia. A great hang indeed! November 17, 2012: Uncle Joe was joined by KLOS' own Cynthia Fox for the Annual KLOS Stuff A Truck Food Drive to help the Salvation Army and the 2nd Harvest Food Bank of Orange County. The goal was to fill a big Salvation Army truck at the Stater Brothers at 3325 East Chapman Avenue (at Prospect) in Orange with non-perishable food items. Good times for a good cause! October 24, 2012: It was a very chilly morning, but Unc looked oh so stylish in his "Official Orange Apron" as he greeted folks at The Home Depot at 12960 Foothill Blvd. (right off the 210) in San Fernando. A contractor's breakfast, vendor demonstrations and raffles — oh my! October 20, 2012: It was a huge Grand Opening party! And of course there was a KLOS Cool Patrol Uncle Joe Meet & Greet at the new Orchard Supply Hardware at 2020 S. Bundy (at La Grange) in West L.A.! October 13, 2012: There was J.B. hanging with the KLOS Cool Patrol before the start of the AMA Pro Flat Track World Finals at the Fairplex in Pomona. After that, he was hanging with the crowd to cheer on the best of the best in the flat track motorcycle racing world for the championship! October 11, 2012: Rocking out to Led Zeppelin live! Uncle Joe hosted Jason Bonham's Led Zeppelin Experience at the Greek Theatre and everyone had blast! October 10, 2012: Uncle Joe hosted a book signing for his old friend/famed record producer/engineer Ken Scott at the Barnes & Noble at The Grove at Farmers Market. Good times! October 6, 2012: They're not kidding when they say "Everything Off-Road!" Perfect for an official KLOS Cool Patrol Uncle Joe Meet & Greet surrounded by hundreds and hundreds of Off-Road vehicles at the 2012 Lucas Oil Off-Road Expo powered by General Tire at the Pomona Fairplex! Everything from off-road racing to rock crawling, trail riding to sand sports, motorcycles and ATV's and RC cars... rocking! September 21, 2012: Party time in the Hollywood & Highland Center as Uncle Joe broadcast LIVE from the Rolling Stone LA. Food and drink specials, the Dos Equis Girls and more! September 14 - 15, 2012: The IZOD IndyCar Series returned to the Auto Club Speedway for the 2012 season finale! In addition to broadcasting his Friday afternoon show on KLOS from the track, Uncle Joe announced Friday's practice and qualifying sessions and Saturday's MAVTV 500 INDYCAR World Championship race under the lights. Amazing racing! September 8, 2012: After a wild Saturday evening Uncle Joe Meet & Greet at the KLOS Cool Patrol Booth at the L.A. County Fair, Joe welcomed the sell-out crowd and Styx to the main stage! Hail, hail Rock & Roll! September 2, 2012, 6pm: After the official Uncle Joe Meet & Greet at the KLOS Cool Patrol Booth, Unc hosted Grand Funk Railroad and former Guess Who lead vocalist Burton Cummings evening shows on the L.A. County Fair's main stage. September 1, 2012: More than just a Labor Day KLOS Cool Patrol Uncle Joe Meet & Greet, it was a huge Grand Opening party at Orchard Supply Hardware at 19330 Hawthorne Blvd. (just south of 190th) in Torrance! August 25, 2012: The best way to celebrate a Grand Opening is with an official KLOS Cool Patrol Uncle Joe Meet & Greet! And the party rocked at Laidlaw's Harley-Davidson at 1919 Puente Ave. (right off the 10 freeway) in Baldwin Park. August 24, 2012: Party time in the L.B.C.! J.B. broadcast his KLOS show from Glory Days Sports Grill at 4121 Woodruff Avenue (and Carson) in Lakewood. And yes, the Dos Equis girls were there too! August 18, 2012: One serving's never enough! J.B. and the KLOS Cool Patrol took their rockin' ice cream festival into the Baskin Robbins at 20445 Devonshire in Chatsworth! Good times indeed! August 14, 2012: J.B. opened for Mötley Crüe and KISS at the KLOS Company Picnic! After finishing his KLOS airshift LIVE from the Verizon Wireless Amphitheater in Irvine, the head banging proceeded with amazing vigor! August 11, 2012: It was a delicious festival of rockin' ice cream and fun as Uncle Joe and the KLOS Cool Patrol stopped by the Baskin Robbins at 10563 Riverside Drive in Toluca Lake! August 9, 2012: Truly one of the best — Heart rocked the Pacific Amphitheatre at the Orange County Fair and J.B. was right there to host the event! August 6, 2012: Hot day, hot party... Yer Uncle Joe's LIVE broadcast of the KLOS Aerosmith Pre-Hollywood Bowl Party rocked Rolling Stone LA in the Hollywood & Highland Center! August 4, 2012: Big fun as J.B. hit the Motorcycle Madness XDL Championship Series at the Queen Mary, the world's premiere stunt riding championship. Lots of bikes, families, friends, music, food and drink! July 28, 2012: Paul Rodgers — one of the greatest voices in all of Rock & Roll — returned to the Fender Center for the Performing Arts to rock a benefit for the Les Paul Kids Rock Free music program. As you'd expect, Uncle Joe was there to MC the show and do a MAV-TV interview. Stay tuned for air dates! July 26, 2012: It was a huge year for the 31st Annual KLOS Blood Drive, and J.B.'s broadcast from Scheu Family YMCA at 1150 E. Foothill Boulevard in Upland (across from San Antonio Community Hospital) saw record donations! June 30, 2012: Quite the crowd joined Uncle Joe in enjoying the outstanding talent line-up for this year's Irvine Lake Blues Festival, including the legendary Walter Trout, Ana Popovic and more. June 12, 2012: Uncle Joe's LIVE Van Halen Pre-Show KLOS broadcast from Hooters at 2438 East Katella in Anaheim (just West of the Honda Center) ROCKED! Cold drinks, hot wings, Hooters Girls, the last pair of Van Halen tix to the show and yer Uncle Joe behind the Orange Curtain — whew! May 31, 2012: As you'd expect, Joe hosted the All-Star Bonzo’s Birthday Bash: A Tribute Concert to John Henry Bonham of Led Zeppelin at the House Of Blues on Sunset. Celebrating Led Zeppelin drummer John Bonham's 64th birthday, over 22 of Rock's finest drummers performed their favorite Zeppelin song in tribute to Bonzo. June 1, 2012: Uncle Joe's LIVE Van Halen Pre-Show KLOS broadcast from Hooters on South Figueroa was the rowdiest of all! 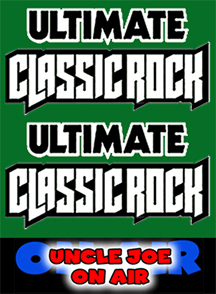 Cold drinks, hot wings, Hooters Girls, the last pair of Van Halen tix to the sold-out show and yer Uncle Joe! May 18 - 20, 2012: First Uncle Joe broadcast his KLOS show live from Hennessey's in Dana Point. Then on Saturday and Sunday he was on stage when Steve Miller, Gregg Allman and Buddy Guy headlined the 15th Annual Doheny Blues Festival. A great time hanging next to the ocean! May 5, 2012: The timing was perfect — J.B. spending a beautiful afternoon hanging with the KLOS Cool Patrol at the O'Reilly Auto Parts at 875 West Foothill Blvd (between Mountain & Euclid) in Upland! May 6, 2012: The first date of the KLOS Summer Concert Series at the Greek saw Uncle Joe kicking out the jams to welcome Ted Nugent, Styx & REO Speedwagon! Hail, hail Rock & Roll! May 21, 2012: Talk about connectivity! J.B. and the KLOS Cool Patrol had a blast meeting folks at the T-Mobile store at 333 S. Vincent Avenue in West Covina! April 13 - 15, 2012: The heavy rains on Friday the 13th wiped out Uncle Joe live broadcast from the Toyota Grand Prix of Long Beach, but as the weather returned, so did the fun! Just like he's done every April since 1986, J.B. visited Bruce Flanders and Terry Clanton on the PA, and did Saturday and Sunday Meet & Greets! And hosting the Tecate Light Rock-N-Roar Concert Starring Joan Jett & The Blackhearts Saturday evening was a blast! March 23 - 25, 2012: There was J.B. working non-stop at the NASCAR Sprint Cup Auto Club 400 just like he's done at every race since the Auto Club Speedway opened in 1997! In addition to hosting the Fan Zone's big stage and broadcasting his KLOS Friday afternoon drive program from the NASCAR garages, he also did major driver interviews and called both the NASCAR Nationwide and NASCAR Sprint Cup races from the announcers' booth. February 18, 2012: Monster Trucks, mega horsepower, raw mud and Uncle Joe at Dodger Stadium! Yep — it was the Advance Auto Parts MONSTER JAM! February 11 & 12, 2012: Yer Uncle Joe had some serious high speed rocking going on at the 52nd O'Reilly Auto Parts NHRA Winternationals Drag Races at the Auto Club Raceway in Pomona. Randy Balough raced his Uncle Joe's Super Gas Corvette and the two did their Saturday and Sunday Meet & Greets with the KLOS Cool Patrol. January 28, 2012: Good times! The Uncle Joe Meet & Greet with the KLOS Cool Patrol rocked at the biggest, most important hot rod show in the world — the 63rd Annual Grand National Roadster Show at the Fairplex in Pomona. Check out the pix! January 21, 2012: The world famous NAMM Show (National Association of Music Merchandisers) in the Anaheim Convention Center is the biggest musical equipment trade show in the world. Makes sense that J.B. based himself at the The House Research Institute booth — gotta keep yer ears working! December 15, 2011: Uncle Joe's LIVE Mark & Brian Christmas Show Pre-Party KLOS broadcast from Hooters on South Figueroa (just across from the Staples Center) was a party! There's nothing like a Hooters Holiday party! November 21, 2011: Nothing like checking out the latest cars at the L.A. Auto Show, then discussing them with Uncle Joe at the KLOS Cool Patrol! November 19, 2011: Uncle Joe was hanging with folks who joined in the Annual KLOS Stuff A Truck Food Drive to help the Salvation Army and the 2nd Harvest Food Bank of Orange County. The goal was to fill a big Salvation Army truck at the Stater Brothers at 375 N. Azusa Avenue in West Covina with non-perishable food items. Good times for a for good cause! November 12-13, 2011 The last big drag meet of the year and the final round of the Full Throttle Series Countdown to the Championship — the Automobile Club of Southern California NHRA Finals! The traditional Saturday and Sunday Uncle Joe Meet & Greets were a blast, and Unc gave away another bitchin' Harley Davidson Street Bob on Sunday. And then Randy Balough (last year's Super Gas Finals winner) made it to the Quarter Finals in his Uncle Joe's Super Gas Corvette to wrap up another successful season! October 15, 2011: J.B. was hanging with the KLOS Cool Patrol before the start of the AMA Pro Flat Track World Finals at the Fairplex in Pomona. Then he joined the crowd cheering on best of the best in the flat track motorcycle racing world for the championship! October 14, 2011: Rocking out to Led Zeppelin live! Unc joined Jason Bonham's Led Zeppelin Experience as they took over the Greek Theatre! October 8, 2011: We weren't kidding when we said "Everything Off-Road!" Uncle Joe was meeting folks at the 2011 Lucas Oil Off-Road Expo powered by General Tire at the Pomona Fairplex and talking off-road racing, rock crawling, sand sports, motorcycles and ATV's. Good times! October 1, 2011: Looking ever so stylish, Unc wore his "Official Orange Apron" as he was greeting folks at The Home Depot at 1625 S. Mountain Ave. in Monrovia. Here are a few snapshots of the fun in the sun! September 25, 2011: After a wild Sunday evening Uncle Joe Meet & Greet at the KLOS Cool Patrol Booth at the L.A. County Fair, Joe kicked out the jams to welcome Styx & REO Speedwagon to the main stage. Hail, hail Rock & Roll! September 22, 2011: After rocking an Uncle Joe Meet & Greet at the KLOS Cool Patrol Booth at the L.A. County Fair, J.B. brought The Doobie Brothers onto the main stage! August 11, 2011: Who better to host the Kansas and Blue Öyster Cult concert at the Pacific Amphitheatre under a Full Moon than your Uncle Joe! Check out the pix! August 3, 2011: A beautiful Summer evening, an Uncle Joe Meet & Greet with the KLOS Cool Patrol and J.B. introducing old friends Pat Benatar & Neil Giraldo on the Pacific Amphitheatre stage. Here are a few fotos of the fun! July 27, 2011: Unc returned to the Orange County Fair to introduce one of the greatest voices in all of Rock & Roll — Paul Rodgers. What a Rock & Roll show!! July 28, 2011: Among the thousands of donors participating in the 30th Annual KLOS Blood Drive was a hardy crew hanging with Uncle Joe at the Glendale Civic Center! Nothing like helping save someone's life while you're scoring a bitchin' KLOS shirt and concert ticket as well as joking with Joe! Here are a few photos. July 21, 2011: Joe kicked off his run at the 2011 Orange County Fair by giving Ace of Cakes' Chef Duff Goldman a rowdy welcome, then amping up the full house for Steve Miller's return to the Pacific Amphitheatre! Check out a few pix (especially the food!). July 15, 2011: What a combination: J.B., the KLOS Cool Patrol and Mike Thompson's RV Super Sale. June 25, 2011: Hundreds of incredible rides for sale and J.B. going crazy — it had to be the Barrett-Jackson collector car auction at the O.C. Fair & Event Center in Costa Mesa! Look at all the folks having fun! June 19, 2011: Uncle Joe and the KLOS Cool Patrol returned for a giant Father's Day bash, meeting folks and telling stories at RideMakerz in Downtown Disney! Check out a few pix. June 18, 2011: J.B. had the honor of hosting the dedication of the Alex Xydias Center for Automotive Arts at the L.A. Fairplex. A war hero, one of the pioneers of California hot rodding and a very successful entrepreneur, Alex is the perfect inspiration for future generations of car enthusiasts! Here are some cool shots. June 11, 2011: As the sun set in the Western sky, there was Unc on stage welcoming Jethro Tull back to the Greek Theatre to celebrate the 40th anniversary of their classic "Aqualung" album. A few snappy photos for your viewing pleasure. June 4, 2011: J.B. finally earned his "Official Orange Apron" at The Home Depot at 435 West Katella Avenue in Orange. Check it out! May 14, 2011: Fun fun fun with Uncle Joe and the KLOS Cool Patrol at the Performance Bicycle Grand Opening in the Long Beach Town Center! Good times indeed! May 7, 2011: Backyard Barbecue time in Torrance! Contest winner Shannon Wolfe welcomed J.B. and the KLOS Cool Patrol as Kingsford Matchlight Charcoal supplied the grill and the grub — Shannon's neighborhood may never be the same! Here are loads of pix of delicious fun! April 23, 2011: Time for an Earth Day celebration — and some home repairs at The Home Depot at 12975 West Jefferson Boulevard in Los Angeles. Check out the happy faces! April 15 - 17, 2011 Everyone knows that Joe Benson has been part of the Toyota Grand Prix of Long Beach every April since 1986. So there he was on the P.A. with Bruce Flanders and Terry Clanton, and doing Meet & Greets — he's just part of the party on the streets! Here are a few snapshots to prove it. March 25 - 27, 2011: Of course J.B. was working non-stop at the NASCAR Sprint Cup Auto Club 400, just like he's done at every race since the Auto Club Speedway opened in 1997! In addition to hosting the Fan Zone's big stage and broadcasting his Friday KLOS program from the NASCAR garages, he did major driver interviews (Joey Logano, 4-time Champ Jeff Gordon and 5-time Champ Jimmie Johnson) and called both the NASCAR Nationwide and NASCAR Sprint Cup races from the announcers' booth. Scope out a few prime photos! March 5, 2011: Joe, the KLOS Cool Patrol, George Barris and Hollywood Car Designer Fireball Tim ricked the Grand Opening of the brand new Speed Shop at Pep Boys at 215 East Katella Avenue and Glassell in Orange! Here are a few snapshots. February 24 - 28, 2011: Sure it rained and hailed, but the 51st Kragen/O'Reilly Auto Parts NHRA Winternationals Drag Races at the Auto Club Raceway in Pomona was a record breaking event! Randy Balough raced his Uncle Joe's Super Gas Corvette into the third round and J.B. took part in the tribute to Don 'The Snake' Prudhomme. Check out these pix!! February 19, 2011: Horsepower and mud flew through the air in the Advance Auto Parts MONSTER JAM's first visit to Dodger Stadium! Just look at it! February 15, 2011: Git-R-Done! J.B. hosted a special group of KLOS contestants' chance to win Larry The Cable Guy's Ford F-150 truck at Rock & Brews in El Segundo. January 29, 2011: It was a rollicking time at the Uncle Joe Meet & Greet with the KLOS Cool Patrol at one of the biggest, most important hot rod shows in the world — the 62nd Annual Grand National Roadster Show at the Fairplex in Pomona. Check it out! January 12 & 13, 2011: The Groove Remains The Same: A Double Encore! Wednesday at the Key Club in Hollywood and Thursday at the Galaxy Concert Theater in Anaheim. Twenty of Rock's biggest drummers played their favorite Led Zeppelin songs with yer Uncle Joe hosting both amazing shows. Check out these award winning photos of last September's special event! January 10, 2011: Uncle Joe hosted Ozzy Osbourne's signing of a one-of-a-kind 10-foot tall fiberglass Gibson Les Paul guitar at the House of Blues on Sunset. Here are a few photos of the fun! December 31, 2010: The O.C. Fair New Year's Eve Block Party rocked! Uncle Joe hosted The Seventies party hangar featuring three outstanding bands: Journey Unauthorized, the Heart tribute band Dog 'N' Butterfly and the "Led Zeppelin Live" starring Heartbreaker. Eee-yow! November 22, 2010: You know Joe smiling the whole time he was hanging with the KLOS Cool Patrol at the L.A. Auto Show — one of the biggest in the world! November 20, 2010: This year the Annual KLOS Food Drive helped Harvesting Hope! In the midst of a pouring rain storm, Uncle Joe collect non-perishable food items to fill a big Salvation Army truck at the Stater Brothers at 375 N. Azusa Avenue in West Covina. Good times! November 12 - 14, 2010: The last big drag meet of the year and the final round of the Full Throttle Series Countdown to the Championship — the Automobile Club of Southern California NHRA Finals! There were fun Uncle Joe Meet & Greets, and Unc gave away another bitchin' Harley Davidson Street Bob. But THEN Randy Balough won the Super Gas Finals in his Uncle Joe's Super Gas Corvette!!! Check it out! October 17, 2010: A steady drizzle didn't stop the South Bay from checking out the Uncle Joe's Racing Mustang as J.B. was hanging with the KLOS Cool Patrol at the Kragen O'Reilly Auto Parts in Torrance! Much fun and frivolity was had! October 16, 2010: Did they really let Uncle Joe run wild through the building supplies and paint departments at The Home Depot at 12300 La Mirada Boulevard in La Mirada? Check it out! October 8 - 10, 2010: J.B. spent the weekend announcing at the Auto Club Speedway — for the final time as part of the NASCAR Sprint Cup Race For The Chase to the Championship! High points included broadcast of his KLOS program, interviews with Danica Patrick, Jimmie Johnson and Martin Martin and calling the races from the announcers' booth. Here are a few photos of the fun! October 2, 2010: Following another Uncle Joe Meet & Greet at the KLOS Cool Patrol Booth at the L.A. County Fair, Joe introduced Bad Company on the L.A. County Fair's main stage for one of the band's last reunion shows. What a great night! September 25, 2010: Joe hosted the all star Bonzo: The Groove Remains The Same event at the Key Club in Hollywood. Thirty years after the death of Led Zeppelin drummer John Bonham, over 20 of L.A.'s finest drummers performed in tribute to Bonzo. Here are a few award winning pictures of this special event. September 17, 2010: Steve Miller returned to the Fender Center in Corona to do a special benefit for the Kids Rock Free music education program. As the photos clearly demonstrate, J.B. was also there to help raise money for the kids! September 9, 2010: After a particularly wild Uncle Joe Meet & Greet at the KLOS Cool Patrol Booth, Joe hosted Creedence Clearwater Revisited on the L.A. County Fair's main stage. Got a few pix for you here! September 10, 2010: It was a glorious Friday afternoon when the O'Fallon family opened their home to a batch of friends and the KLOS Cool Patrol for a private Uncle Joe's Backyard Barbecue party! Check out the photos! September 9, 2010: Snorting, fire-breathing Monster Trucks leapt through the air in front of the main grandstand at the L.A. County Fair! Check out the Bounty Hunter and Uncle Joe's Meet & Greet to sample the Rockin'! September 1, 2010: Joe was there for the Grand Opening of the Axes & Axles Hot Rod Show at the NHRA Motorsports Museum. August 28, 2010: Uncle Joe hosted the big time reveal of Fireball Tim's latest creation: The REDSTER! Here's what the big event looked like! August 15, 2010: What a party! J.B. got things going big time before the ZZ Top concert at the Pacific Amphitheatre during the Orange County Fair. Here are a few dazzling photos. August 6, 2010: Of course Uncle Joe hosted the Styx Pacific Amphitheatre concert the Orange County Fair! Here are a couple of fotos. July 27, 2010: Joe spent time meeting folks before donating a pint of his blood at the Glendale Civic Center as part of the 29th Annual KLOS Blood Drive. Feast your eyes on a few fun fotos of the festivities! July 25, 2010: J.B. spent a beautiful afternoon hanging with his Uncle Joe's Racing Mustang and the KLOS Cool Patrol at the Kragen O'Reilly Auto Parts in Walnut! Check it out! July 11, 2010: Great fun as Joe hosted the KLOS Summer Concert Series with Steve Miller and Los Lobos at the Greek Theatre! Here are a few photos. July 7, 2010: J.B. and the KLOS Cool Patrol made the scene at the City of Industry Speedway as the Speedway Bikes raced around without brakes! July 5, 2010: There was yer Uncle Joe and the KLOS Cool Patrol at the entrance to Dodger Stadium before the Los Angeles Dodgers/Florida Marlins game, the salute to the Iraq and Afghanistan Veterans of America and huge Independence Day Fireworks display after the game! Here are a few fotos. June 25, 2010: Check out the fotos of Rush receiving their star in the Hollywood Walk of Fame with able assistance from J.B. himself. June 20, 2010: Uncle Joe, along with super hot rod designers Chip Foose and Fireball Tim, spent Father's Day meeting folks at RideMakerz in Downtown Disney. Check out the pix! May 22, 2010: J.B. and the KLOS Cool Patrol hanging out at the La Habra Lowe's Home Improvement Warehouse, meeting folks and having fun! May 15, 2010: Uncle Joe was welcoming folks to the 4th Good Guys Orange County Get Together Hot Rod Show in Costa Mesa. Maybe next year his car will be there among the best Hot Rods the O.C. has to offer! May 1, 2010: Sporting his newest fedora, J.B. returned to host the Kentucky Derby Party at the indoor/outdoor Fairplex Satellite Wagering Sports Bar and Grill! Mint Juleps, an Outrageous Hat Contest and more Mint Juleps... and a horse race with an unexpected winner! April 16 - 17, 2010: Joe Benson has been part of the Toyota Grand Prix of Long Beach every April since 1986. So it was no surprise to hear him on the P.A. and find him doing Meet & Greets at the KLOS Cool Patrol booth — just part of the party on the streets! Here are a few photos. April 15, 2010: What a Meet & Greet! Uncle Joe and Venom race driver Marco Andretti with his Izod IndyCar race car meeting folks just before the Toyota Grand Prix of Long Beach at the Chevron station at Long Beach Boulevard and West PCH. March 27 - 28, 2010: J.B. was right there when the AMA Suzuki Superbike Challenge rolled back into the Auto Club Speedway. With his old buddy Dave Koenig calling the play-by-play, Unc did some color commentary as well as pre-race and Victory Lane interviews for all of the big races. March 5, 2010: Uncle Joe was front and center when the 2010 edition of the Experience Hendrix Tour tribute rolled into the Gibson Amphitheatre, featuring guitarists Joe Satriani, Eric Johnson, Brad Whitford of Aerosmith, Kenny Wayne Shepherd, Jonny Lang as well as Cesar Rojas and David Hidalgo of Los Lobos and bassist Billy Cox of The Jimi Hendrix Experience and Band Of Gypsys, among others. February 19 - 21, 2010: Starting with a live broadcast of his Friday afternoon KLOS show from a pit side suite, J.B. was working non-stop at the Auto Club Speedway's NASCAR Sprint Cup Auto Club 500! In addition to hosting the Fan Zone's big stage (featuring Styx Sunday morning), he did a number of major driver interviews and called both the NASCAR Nationwide and NASCAR Sprint Cup races from the announcers' booth. Check out these prime photos. February 13 - 14, 2010: It's true! Yer Uncle Joe won drag races against KLOS listener Raul Walker and 10-time NHRA Pro Stock Champion Bob Glidden in front of 50,000 race fans at the 50th Anniversary NHRA Kragen/O'Reilly Auto Parts Winternationals Drag Races at the Auto Club Raceway in Pomona! He also guided a stroll down memory lane at the "Golden 50 Corral" and did a full on Meet & Greet with Randy Balough before Randy raced his Uncle Joe's Super Gas Corvette into the quarter-finals! Look at these pictures!! February 1, 2010: J.B. hosted the Todd Rocks Benefit Concert at the House Of Blues – Anaheim. The event was to help Todd Larsen, founder of the Irvine Music Academy and a 14-year veteran coach in the 2,000+ member Irvine Swim League, who was diagnosed with a deadly leukemia last Fall. In addition to several of Todd's former students of the Irvine Music Academy, the performers included Def Leppard guitarist Vivian Campbell, famed drummer Mark Shulman, Pink's bassist Eva Gardner and Broadway star Jon Abrams. December 12, 2009: Unc indulged in some raucous fun building custom RC cars at RideMakerz in Downtown Disney! Many people stopped by the KLOS Cool Patrol to join in, as the pix show. December 4, 2009: On site as usual! Joe was hanging with the KLOS Cool Patrol on the opening day of the L.A. Auto Show! November 24, 2009: J.B. hosted the Bessie Mae Berger Benefit Show at the Laugh Factory – Long Beach. Kevin Nealon and Paul Rodriguez were among the featured entertainers. November 14 - 15, 2009: The last big drag meet of the year and the final round of the Full Throttle Series Countdown to the Championship: the Automobile Club of Southern California NHRA Finals in Pomona! There were massive Uncle Joe's Meet & Greets with the KLOS Cool Patrol, J.B. gave away a bitchin' Harley Davidson and Randy Balough raced his Uncle Joe's Super Gas Corvette. Here's what it looked like. October 22 - 23, 2009: Of course Unc was on stage with Steve Miller for benefit concerts for at the University of Southern California Thornton School Of Music. Check out a few snapshots. October 9 - 10, 2009: J.B. spent the weekend announcing at the Auto Club Speedway — this time as part of the NASCAR Sprint Cup Race For The Chase to the Championship. Starting with a Friday afternoon broadcast of his KLOS program, he returned as the Master of Ceremonies on The Fan Zone's big stage before switching to call the races from the announcers' booth. Here are a few photos of the action. October 3, 2009: No one better than Uncle Joe and Cynthia Fox to host the L.A. Kings Opening Night Rocktoberfest! The legendary Luc Robataille was on hand, and both Led Zeppagain and Which One's Pink performed on stage. What a crowd and what a bash! October 1, 2009: Do any two words put more fear into auto insurance companies than Demolition Derby? J.B. promised his mom he wouldn't drive in one, but that didn't keep him from calling the action at the L.A. County Fair! Smashing indeed! September 24, 2009: After another Uncle Joe Meet & Greet at the KLOS Cool Patrol Booth at the L.A. County Fair, Unc introduced old friends Pat Benatar & Neil Giraldo on the L.A. County Fair's main stage. September 13, 2009: Following a rocking Uncle Joe Meet & Greet at the KLOS Cool Patrol Booth at the L.A. County Fair, Joe brought Lynyrd Skynyrd onto the main stage. Check out the pix. September 11, 2009: After a wild Uncle Joe Meet & Greet at the KLOS Cool Patrol Booth at the L.A. County Fair, Joe hosted the Peter Frampton & Kansas concert on the main stage. Hail, hail Rock & Roll! September 9, 2009: Check out these photos of Uncle Joe's broadcast from The Beatles' main recording studio, Abbey Road Studio 2 in London on 09-09-09. Here are a few Fab fotos! Steve Miller In The O.C. August 1, 2009: There was Unc with his buddy Steve Miller on stage at the Pacific Amphitheatre! July 30, 2009: Joe broadcast live from San Antonio Community Hospital at 999 San Bernardino Road in Upland as part of the 28th Annual KLOS Blood Drive. Much fun was had and the Blood Drive was a world record breaker! Here are a few fotos from the party. July 26, 2009: Unc hosted Pat Benatar & Neil Giraldo's concert with Blondie at the Pacific Amphitheatre — and it rocked! July 10, 2009: The first day of the Orange County Super Fair was perfect for another live UNCLE JOE'S HAPPY HOUR TOUR broadcast on KLOS! On the air from the home of deep fried avocados, you know the gig turned into a big ol' Heart concert pre-show party! May 22, 2009: It was a wild Styx/REO Speedwagon concert pre-show live broadcast from ROCK'N FISH next to the Nokia Theatre at L.A. Live in downtown Los Angeles! And once Unc got on stage inside the Nokia Theatre, he really got the crowd revved up! Where do you suppose he'll land next? May 2, 2009: Wearing his trusty fedora, Uncle Joe hosted a Kentucky Derby Party at the all-new, indoor, outdoor Fairplex Satellite Wagering Sports Bar and Grill. Mint Juleps, an Outrageous Hat Contest and more Mint Juleps... and a horse race too! Here are the only photos that turned out. April 17 - 19, 2009: Uncle Joe Benson has been part of the Toyota Grand Prix of Long Beach every April since 1986. This year, he kicked off the weekend with a Friday broadcast from Bubba Gump's Shrimp Company. Saturday and Sunday mornings found him doing lengthy Meet & Greets at the KLOS Cool Patrol booth. Take a look at last year's photos. April 4, 2009: The FIRST EVER KLOS SHAKIN' BAKE FESTIVAL rocked at Santa Anita Park! Mark Farner from Grand Funk Railroad hit the stage, there was hot BBQ and cold refreshments plus the Miss Hawaiian Tropic Model Search! March 28, 2009: Uncle Joe with the KLOS Cool Patrol made the scene at the Super Chevy Hot Rod Show and Drag Race at the Auto Club Speedway in Fontana for some Springtime fun! Hundreds of cars were on display and racing! Check out the pix! March 21 & 22, 2009: Once again J.B. was announcing at the AMA Suzuki Pro Superbike Challenge at the Auto Club Speedway. With Dave Koenig calling the play-by-play, J.B. added in his usual color commentating and analysis as well as pre-race and Victory Lane interviews for the races. February 20 - 22, 2009: Like he's done every year since the track opened in 1997, Uncle Joe announced at the Auto Club Speedway's NASCAR Sprint Cup Auto Club 500. Starting with a broadcast from the track of his Friday afternoon KLOS show, Unc reprised his role as the Fan Zone's Master of Ceremonies, called the races from the announcers' booth and did over a dozen driver interviews and a special session with 3-time NASCAR Cup Champion Jimmie Johnson. Check out the photos! February 19, 2009: In preparation for the weekend's NASCAR Sprint Cup Auto Club 500 at the Auto Club Speedway — and to celebrate NASCAR racer Tony Stewart's new sponsorship — Uncle Joe and the KLOS Cool Patrol stopped by the Office Depot at Foothill and Day Creek Boulevard in Rancho Cucamonga! February 7 - 8, 2009: Right in the middle of all the rain, there was J.B. at the NHRA Kragen/O'Reilly Auto Parts Winternationals Drag Races at the Auto Club Raceway in Pomona. Not only did the storms greatly alter the Saturday and Sunday Uncle Joe's Meet & Greets with the KLOS Cool Patrol, Randy Balough never got to race his Uncle Joe's Super Gas Corvette! Check out a few soggy pictures! January 24, 2009: Time for a Uncle Joe Meet & Greet with the KLOS Cool Patrol at the one of the biggest, most important hot rod shows in the world — the 60th Annual Grand National Roadster Show! Here's what it looked like. December 7, 2008: Unc returned as the Grand Marshal of the 20th Annual Pomona Valley Harley Owners Group Toy Run at the Elks Lodge in Ontario. The line-up included the KLOS Cool Patrol, bike games, raffles, food, music and – of course – a motorcycle show and toy donations to help kids at Christmas! November 21, 24 and 26, 2008: You know that Joe was right there playing like a kid in a toy store, broadcasting live from the L.A. Auto Show! November 15 - 16, 2008: The Automobile Club of Southern California NHRA Finals in Pomona was the last big drag meet of the year and the final round of the POWERade Series Countdown to the Championship. There were Saturday and Sunday Uncle Joe's Meet & Greets with the KLOS Cool Patrol, J.B. gave away another Harley Davidson and Randy Balough raced his Uncle Joe's Super Gas Corvette! Here's what it looked like. November 2, 2008: J.B. hosted the Experience Hendrix concert featuring Mitch Mitchell, Billy Cox, Buddy Guy, Jonny Lang, Kenny Wayne Shepherd, Robby Krieger of The Doors, Eric Johnson, David Hidalgo & Cesar Rosas of Los Lobos with special performances by Hubert Sumlin, Chris Layton, Doyle Bramhall II, Eric Gales and more at the Greek Theatre. October 26, 2008: Uncle Joe and the KLOS Cool Patrol were rocking at the 25th Annual Love Ride and 2008 California Bike Week event at the L.A. County Fairplex in Pomona. Thousands of motorcycles, hundreds of vendor booths and dozens of activities included Jay Leno serving as the Grand Marshal and yer Unc introducing ZZ Top and the Foo Fighters. As always, the money raised went to the Muscular Dystrophy Association and local children's charities. October 3, 2008: Time for another of those famous Uncle Joe remote broadcasts from the Chrysler/Jeep exhibit at the O. C. Auto Show in the Anaheim Convention Center! September 20, 2008: Sand rails and buggies and trucks and off-road partying! Time for another Uncle Joe/KLOS Cool Patrol Meet & Greet at the biggest off-road show in the land — the Sand Sports Super Show at the O.C. Fairground in Costa Mesa! September 7, 2008: They rocked! Once again there was Uncle Joe introducing his old friends The Doobie Brothers and Grand Funk Railroad on the L.A. County Fair's main stage! August 29 - 31, 2008: As he has for every major race since the track opened in 1997, J.B. spent the weekend announcing at the Auto Club Speedway. Starting with a Friday afternoon broadcast of his KLOS show, Unc returned Saturday and Sunday as the Master of Ceremonies on The Fan Zone's big stage before switching to call the races from the announcers' booth after dark. Check it out! August 28, 2008: Uncle Joe and the KLOS Cool Patrol were at the Office Depot in Rancho Cucamonga to welcome NASCAR Sprint Cup driver Carl Edwards for a special Meet & Greet — but Carl phoned in sick! So Joe and the fans signed a big Get Well card for him while sharing stories about his escapades. Here are a few of photos of the fun. August 17, 2008: J.B. hosted Jethro Tull's successful return to the Greek Theatre. Here are a few snapshots. July 30, 2008: J.B. broadcast live from the Red Cross Donor Center in Pomona on the first day of the 27th Annual KLOS Blood Drive. The Blood drive was a record breaker, and Unc's pix should be quite interesting! May 17, 2008: The NASCAR Sprint Cup All Star Race Party at Yankee Doodles in Santa Monica was a blast! Check out these snapshots of the party. April 26 - 27, 2008: Once again J.B. announced at the AMA Suzuki Superbike Challenge at the Auto Club Speedway. With Dave Koenig calling the play-by-play, Unc did some color commentating and analysis as well as pre-race and Victory Lane interviews for all four of the big races. April 18 - 20, 2008: Uncle Joe Benson has been part of the Toyota Grand Prix of Long Beach every April since 1986. This year, he kicked things off with a Friday broadcast from the Bubba Gump's Shrimp Company. Then Saturday and Sunday mornings were spent doing Meet & Greets at the KLOS Cool Patrol booth. Take a look! April 13, 2008: The 1st Annual B&M/Hurst/McLeod Charity Car Show took place at B&M Racing & Performance at 9142 Independence Avenue in Chatsworth. A good time was had by all! March 29, 2008: The Super Chevy Hot Rod Show and Drag Race and Uncle Joe with the KLOS Cool Patrol returned to the Auto Club Speedway in Fontana. Hundreds of cars on display and racing! Check out the photographic proof. March 15, 2008: Uncle Joe spent the day hanging with the KLOS Cool Patrol at the 2nd Annual Orange County Get Together Hot Rod Show. Under perfect sunny skies, what could be better than chatting with fans and admiring the best Hot Rods the O.C. has to offer! Here's what it looked like. February 22 - 24, 2008: Like he's done every year since the track opened in 1997, Uncle Joe announced at the Auto Club Speedway's NASCAR Nextel Cup Automobile Club 500. Starting with a broadcast of his KLOS show, Unc reprised his role as the Fan Zone's Master of Ceremonies before calling the races from the announcers' booth. Check out a few not-so-soggy photos..
February 9 - 10, 2008: There was J.B. and the KLOS Cool Patrol right in the middle of the first big drag meet of the year — the NHRA CARQUEST Winternationals Drag Races at the Auto Club Raceway at Pomona. Here's a few photos. January 27, 2008: Thankfully the rains held off until after the Uncle Joe Meet & Greet with the KLOS Cool Patrol at the 59th Annual Grand National Roadster Show! Here's what it looked like. December 2, 2007: Unc returned as the Grand Marshal for the 19th Annual Pomona Valley Harley Owners Group Toy Run. Here are a few snapshots of the fun. November 16 & 20, 2007: New dates — new cars! And there was J.B. playing like a kid on the air from the newly rescheduled and revamped L.A. Auto Show!! See for yourself! November 10 - 11, 2007: Uncle Joe and the KLOS Cool Patrol did double duty at the 24th Annual Love Ride and the 2007 California Bike Week at the L.A. County Fairplex in Pomona. Gregg Allman headlined Sunday afternoon's entertainment and J.B. did some Master Of Ceremonies work on the big stage. Check out these snapshots. November 3 - 4, 2007: There were Saturday and Sunday Uncle Joe's Meet & Greets with the KLOS Cool Patrol at the Automobile Club of Southern California NHRA Finals in Pomona. J.B. gave away a Harley and Randy Balough raced his Uncle Joe's Super Gas Corvette into the Final Round of the race and the National Top 10! Here's what it looked like. October 5 - 7, 2007: First, Steve Miller checked in during Joe's Friday afternoon KLOS show. Then Saturday evening, Uncle Joe set the mood for the Steve Miller Band to rock the Greek Theatre performance. Then J.B. hosted the debut screening of Steve's new DVD! October 4, 2007: It was another of those famous Uncle Joe remote broadcasts from the Chrysler/Jeep exhibit at the O. C. Auto Show in the Anaheim Convention Center! Here are a few snapshots. September 27, 2007: Do any two words put more fear into auto insurance companies than Demolition Derby? J.B. promised his mom he wouldn't drive in one, but that didn't keep him from calling the action! September 20, 2007: Grunting, fire-breathing Monster Trucks leaping through the air in front of the main grandstand at the L.A. County Fair! While the Bounty Hunter and Jurassic Attack might not be poetic, when you're talking heavy horsepower, you know yer Unc will be there. September 15, 2007: Sand rails and buggies and trucks and off-road partying! Time for another Uncle Joe/KLOS Cool Patrol Meet & Greet at the biggest off-road show in the land — the Sand Sports Super Show at the O.C. Fairground in Costa Mesa! Here are a few snapshots. September 13, 2007: Professional bull riders, freestyle big air quads, an off-road truck long-jump contest and a monster truck wheelie contest! After hosting last year's first-ever Bull X MotoRodeo in front of the main grandstand at the L.A. County Fair, you just know Unc had to try it again! September 8, 2007: After an official KLOS Cool Patrol Uncle Joe Meet & Greet, Joe ramped up the crowd and introduced his old friends Heart on the L.A. County Fair's main stage! August 31 - September 2, 2007: As he has for every major race since the track opened in 1997, J.B. spent the weekend announcing at the California Speedway. Starting with a Friday afternoon broadcast of his KLOS show from the big stage in the Fan Zone, Unc was the Fan Zone's Master of Ceremonies during daylight hours, then switched to calling the races from the announcers' booth after dark. Here's a few photos. August 30, 2007: Darned if it wasn't lunch hour and there was Unc and the KLOS Cool Patrol at Dave & Busters at the Block At Orange for a pre-race party... and the burgers were delicious! August 10, 2007: After doing his Friday afternoon show from the Pacific Amphitheatre in Costa Mesa, Uncle Joe hosted the opening night of the 95.5 KLOS/Mark & Brian Summer Concert Series — the 95.5 KLOS Five O'Clock Funnies Live! Bill Engvall, Craig Shoemaker and Don Friesen shredded the crowd! Arrrgh Matey – Live From Disneyland! May 10, 2007: Unc broadcast live from Disneyland — at last report he was still singing "It's A Small World." May 9, 2007: J.B. co-hosted the Regional Finals of the King Of The Blues contest with guitarist John Croft at the Guitar Center in Hollywood. How many drummer jokes do you suppose he told? April 28 - 29, 2007: Once again J.B. announced at the Suzuki AMA Superbike 100K at the California Speedway. With Dave Koenig calling the play-by-play, Unc added some color commentating and analysis as well as pre-race and Victory Lane interviews for all four races. April 13 - 15, 2007: Just like every April since 1986, J.B. was once again part of the Toyota Grand Prix of Long Beach. In addition to Friday and Saturday broadcasts, he did huge Meet & Greets all three days at the KLOS Cool Patrol booth. Check out these shots. March 24, 2007: Here are some pix of Uncle Joe and the KLOS Cool Patrol at the first ever Super Chevy Hot Rod Show and Drag Race at the California Speedway in Fontana! March 10, 2007: Uncle Joe was right in the middle of the 1st Orange County Get Together Hot Rod Show, chatting with fans and admiring the best Hot Rods the O.C. has to offer! Here's what it looked like. February 23 - 25, 2007: Like he's done every year since the track opened in 1997, Uncle Joe was announcing at the California Speedway's NASCAR Nextel Cup Automobile Club 500 — starting with a Friday afternoon broadcast of his KLOS show from the big stage. Check out the photos. February 12, 2007, 3p - 7p: With his voice front and center in the new Rockin' Space Mountain, it only makes sense that Uncle Joe would broadcast live on KLOS from Disneyland and California Adventure! Here are a few fotos. February 10 - 11, 2007: J.B. and the KLOS Cool Patrol were right in the middle of the first big drag meet of the year — the NHRA CARQUEST Winternationals Drag Races at the Auto Club Raceway at Pomona! Here are a few action shots. January 27, 2007: Where else would you expect to find the KLOS Cool Patrol and an Uncle Joe Meet & Greet but in the middle of the 58th Annual Grand National Roadster Show! Over 700 of America's most spectacular, innovative and radical street rods, classic customs and motorcycles all in one place. Here's what it looked like! December 3, 2006: Unc returned as the Grand Marshal for the 18th Annual Pomona Valley Harley Owners Group Toy Run. The line-up included the KLOS Cool Patrol, bike games, raffles, food, music and – of course – a motorcycle show all to help kids at Christmas! Here's a glimpse of what it looked like. December 1, 5, 7 & 8, 2006: New dates — new cars! Like a kid in a candy shop, Unc was playing on the air from the newly rescheduled and revamped L.A. Auto Show!! November 19, 2006, 3pm - 5pm: Darned if that wasn't Unc watching the season-ending NASCAR race with the KLOS Cool Patrol at the Circuit City in Glendale. Flat screens everywhere! November 11 - 12, 2006: The Automobile Club of Southern California NHRA Finals in Pomona was the last big drag meet of the year. Saturday and Sunday's NHRA Uncle Joe's Meet & Greets with the KLOS Cool Patrol were huge — here's what it looked like! November 6, 2006: When he wasn't shopping at the brand new Lowe's Home Improvement Center at 2390 South Grove Avenue in Ontario, Unc was hanging with the KLOS Cool Patrol shooting the breeze!. October 5, 2006: Uncle Joe did another of his famous remote broadcasts from the Orange County Auto Show at the Anaheim Convention Center. Here are a few snapshots! September 29, 2006: It was a wild Friday night and Uncle Joe returned to introduce his old friends The Doobie Brothers and Grand Funk on the L.A. County Fair's main stage! September 28, 2006: Do any two words put more fear into auto insurance companies than Demolition Derby? J.B. promised his mom he wouldn't drive in one, but that doesn't mean he can't call the action — or drive one of the tow trucks. All hail the L.A. County Fair for giving you a chance to see for yourself! September 21, 2006: Unc dug right in to host the L.A. County Fair's first-ever Bull X MotoRodeo in front of the main grandstand. With six professional bull riders, two freestyle big air quads, an off-road truck long-jump contest and a monster truck wheelie contest, let's just say the place rocked! September 17, 2006: After an official KLOS Cool Patrol Uncle Joe Meet & Greet, J.B. introduced his old friends Pat Benatar & Neil Giraldo on the L.A. County Fair's main stage! Here's what it looked like! September 16, 2006: Surrounded by hundreds of wild vehicles, it was time for another Uncle Joe Meet & Greet at the biggest off-road show in the land — the Sand Sports Super Show at the O.C. Fairground in Costa Mesa! Here are just a few snapshots. September 14, 2006: Grunting, fire-breathing Monster Trucks leaping through the air in front of the main grandstand at the L.A. County Fair! While the Bounty Hunter and Jurassic Attack might not be poetic, when you're talking heavy horsepower, you know yer Unc will be there. September 9, 2006: After an official KLOS Cool Patrol Uncle Joe Meet & Greet, Joe introduced his old friends Heart on the L.A. County Fair's main stage! Here are a few fotos! September 1 - 3, 2006: As he has for every major race since the track opened in 1997, J.B. spent the weekend announcing at the California Speedway. Starting with a Friday afternoon broadcast of his KLOS show from the big stage, Unc was the Fan Zone's Master of Ceremonies during daylight hours, then switched to calling the races from the announcers' booth after dark. Here are a few photos of the event! July 14, 2006: Unc hosted his buddy Steve Miller's concert at the Pacific Amphitheatre — here's what it looked like! June 18, 2006: It wasn't an official Uncle Joe Meet & Greet, but lots of people joined yer Unc to cruise through the 42nd Annual Los Angeles Roadsters Father Day Show at the Fairplex in Pomona. June 2 - 4, 2006: J.B. raced the Jim Sleeper-prepared Uncle Joe's Nissan 300ZX to a third place in the Super Production class on the California Speedway. Here are a few quick snapshots. June 3, 2006: After a hard day of racing at the California Speedway, Unc cruise the few short miles up I-15 to be part of Sammy Hagar and Michael Anthony show at the Hyundai Pavilion! Here are a few photos! May 17, 2006: J.B. co-hosted the Regional Finals of Guitarmageddon at the Guitar Center on Sunset in Hollywood. Here are a few snapshots. May 6, 2006: Following a screening of The Beatles' "A Hard Day's Night" at the historic Alex Theatre, Joe hosted a panel discussion with famed producer/Beatles engineer Ken Scott and producer/author Brian Kehew. Here's what it looked like! May 6, 2006: here was Uncle Joe, hanging with the KLOS Cool Patrol and chatting with fans at the Goodguys 9th Pomona Nitro Nationals at the Fairplex in Pomona. Surrounded by hundreds of hot rods, Randy Balough had his Uncle Joe's Super Gas Corvette looking mighty fine! Take a look! April 29 - 30, 2006: Once again J.B. announced the Suzuki AMA Superbike 100K at the California Speedway. With Dave Koenig calling the play-by-play, Unc did some color commentating and analysis as well as pre-race and Victory Lane interviews for all five races. April 15, 2006: The Uncle Joe's 300ZX race car was on display at one of the coolest little hot rod shows of the year — the City of La Verne Cool Cruise. April 7 - 9, 2006: Uncle Joe Benson has been part of the Toyota Grand Prix of Long Beach every April since 1986. This year he kicked things off with a Friday broadcast from Bubba Gump's Shrimp Company. Then he did huge Saturday and Sunday Meet & Greets at the KLOS Cool Patrol booth. Take a look! April 1, 2006: Even the rain couldn't stop a real Uncle Joe Meet & Greet in the midst of the 3-day Super Chevy Hot Rod Show and Drag Race at the Auto Club Raceway in Pomona. 1995 Super Chevy race winner, NHRA Division 7 Super Gas Champion Randy Balough was also on hand with his Uncle Joe's Racing Super Gas Corvette. Here's what it looked like! February 24 - 26, 2006: Following the Friday afternoon broadcast of his KLOS program from the California Speedway garage area, Uncle Joe was everywhere announcing at NASCAR Nextel Cup Automobile Club 500 (like he's done every year since the track opened in 1997!). Here are a few photos. February 11 - 12, 2006: The first big drag meet of the year — the NHRA CARQUEST Winternationals Drag Races — and NHRA Division 7 Super Gas Champion Randy Balough, driver of the Uncle Joe's Racing Super Gas Corvette, came within 26/1000 of a second of making the Final Round of competition! Here are some action shots. January 21, 2006: An Uncle Joe Meet & Greet in the midst of the 57th Annual Grand National Roadster Show! The extravaganza featured over 700 of the country's most spectacular, innovative and radical street rods, classic customs and motorcycles. Here's what it looked like! January 6, 10 & 13, 2006: Like a kid in a candy shop, Unc kept going back in! Did he get his hand smacked? See what happened when Joe returned to broadcast live from the L.A. Auto Show on three separate days! December 14, 2005: J.B. hosted the West Coast Finals of the 14th Annual Drum Off at the Guitar Center on Sunset in Hollywood. Celebrity judges included Dean Butterworth of Good Charlotte and Drew Hester (who has worked with Joe Walsh and Lisa Marie Presley). December 15, 2005: It was lunch with Uncle Joe and Van Halen bassist Michael Anthony at the Hard Rock Cafe! Five lucky listeners (and their guest) joined the two old hot rodding buddies to celebrate the introduction of Mad Anthony's Barbecue Sauces. The grand prize was a Yamaha Michael Anthony signature bass — that's hot even without the sauce! Here are a few snapshots. December 4, 2005: Unc returned as the Grand Marshal for the Pomona HOG Toy Run in Ontario, sponsored by the Pomona Valley Harley Owners Group. Bike games, raffles, food, music and – of course – a motorcycle show all to help kids at Christmas! Here's what it looked like. November 30, 2005: It proved to be one of the most successful fundraisers KCET did all year! KLOS' Uncle Joe and Cynthia Fox co-hosted the pledge breaks during "Great Performances: Cream – The Reunion Concert," and the PBS station is set to rebroadcast the show until everyone's seen it! Check out the photos. November 25, 2005: Someone called Unc's guest star turn on ABC's hot new show, "Hot Properties" brilliant (it may have been his mom). For sure his catch phrase ("Tell me about it it.") was almost as memorable as his pink shirt. Now that's Rock & Roll! November 13, 2005: Just after 8pm, there was Joe onstage at the Kodak Theatre in Hollywood introducing his old friends Jethro Tull! Here is a peak inside the famed venue. November 5 - 6, 2005: The Automobile Club of Southern California NHRA Finals in Pomona was the last big drag race of the year. NHRA Division 7 Super Gas Champ Randy Balough raced the Uncle Joe's Racing Super Gas Corvette through four rounds of competition, and both Saturday and Sunday's NHRA Uncle Joe's Meet & Greets with the KLOS Cool Patrol were huge! Here are a few photos. November 4, 2005: Unc broadcast his show live from The Rolling Stones concert at Angels Stadium in Anaheim — here's the photographic proof! October 22, 2005: Uncle Joe emceed the Queen + Paul Rodgers concert at the Hollywood Bowl. Despite the lingering drizzle, the full house rocked from beginning to end! Here's a glimpse of what it looked like. October 19, 2005: Unc hosted the Hollywood finals of the 14th Annual Drum Off at the Guitar Center on Sunset in Hollywood. Here are a few photos of the event. October 15 - 16, 2005: Once again, J.B. announced the Toyota Indy 400 IRL Race at the California Speedway. October 12, 2005: Uncle Joe broadcast on opening day from the California International Auto Show at the Anaheim Convention Center. Here are a few photos of the event. September 25, 2005: After an official KLOS Cool Patrol Uncle Joe Meet & Greet at the L.A. County Fair, Joe introduced his old friends ZZ Top on the Fair's main stage. The place was rocking! September 22, 2005: Giant trucks smashing cars at the L.A. County Fair?!? You know who had to be right in the middle dodging the mud the Monster Trucks were throwing! September 2 - 4, 2005: J.B. announced at the NASCAR Nextel Cup Sony HD 500 under the lights at the California Speedway in Fontana. September 1, 2005: NASCAR Nextel Cup driver (and four-time winner at the California Speedway) Greg Biffle stopped by to chat as Joe broadcast his KLOS afternoon show live from the Speedway in Fontana. September 1, 2005: Uncle Joe hosted KLOS's bloomin' lunch with NASCAR Nextel Cup driver Kyle Petty at the Outback Steakhouse. Many tickets and prizes were awarded! This is what it looked like! August 6, 2005: J.B. was hanging with the KLOS Cool Patrol at the Goodguys 8th Pomona Nitro Nationals at the Fairplex in Pomona! Here's what it looked like! August 6, 2005: It was the last day of the 24th Annual KLOS Blood Drive and Uncle Joe was rocking at the brand new Red Cross Donor Center in Pomona! Here are a few fotos. July 30 - 31, 2005: #1 in points since the third race of the season, J.B. blistered the California Speedway in the Jim Sleeper-prepared Uncle Joe's Nissan 300ZX... until it blew up! So he jumped into a car he'd never driven before, and ended up still leading the points! Here is the full story and a few fotos! July 14 & 16, 2005: Uncle Joe wrapped up his Orange County Fair run with two of four appearances in front of 31,000+ fans at the Pacific Amphitheatre. Thursday, he hosted longtime friends Pat Benatar & Neil Giraldo's concert, then presented Heart's Saturday night show. Check it out! July 15, 2005: Suddenly, there was Uncle Joe broadcasting live from Space Mountain at Disneyland on KLOS! Here are a few fotos! July 11, 2005: Here are a few shots of Joe speaking at Steve Miller's Hollywood RockWalk of Fame induction. July 9 - 10, 2005: J.B. kicked off his four-night Orange County Fair run by hosting comedian Bill Engvall's performance and Steve Miller's concert at the Pacific Amphitheatre. Look at all the people!